Deal with pencil-writing or drawing mistakes with this 5005581 LEGO® Brick Erasers 3-Pack. Molded in the shape of classic 2x4 LEGO bricks, these green, yellow and red erasers are ideal for use at home, school or the office. The LEGO® Brick Erasers – 3-Pack (5005581) Lego set is no longer directly available from the sites below. However, 3rd party partners of these sites might still have the set available. Alternate description Make instant corrections with LEGO® Brick Erasers! 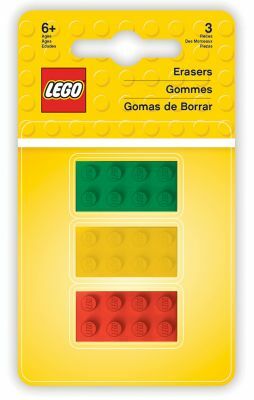 Features green, yellow and red erasers in the shape of classic LEGO® 2x4 bricks. Each eraser measures over 1” (4cm) long.